The Lumiere fingertip veil with pearl details is characterised by its light and fluid silhouette. The Lumiere veil adds an ethereal and effortless feel to classic or minimal wedding gowns, and the scattering of soft ivory pearls across the piece is both mesmerising and modern in appeal. The Lumiere wedding veil is an exquisite piece for the bride craving something a little different. Our admiration for this striking piece lies in its impeccably detailed simplicity, featuring countless pearls reminiscent of snowflakes. Measurements: Fingertip length at 90-100cm (as per your height and dress length). The Lumiere wedding veil is made to order. Please allow 8-12 weeks for production plus delivery times. Rush orders available for a fee. So we can customise this veil to suit you, please leave your height and heel height measurement at checkout. Please also let us know where you intend to position the veil’s comb (at the crown, above a low set bun etc), as this will impact the length of the blusher and the veil. If you have any questions, please feel free to contact us to discuss! The Lumiere is a short veil that’s perfect for brides inspired by a modern and minimal aesthetic. There’s no reason why you can’t have a simple veil with indulgent accents to add an ethereal feel to a classic silhouette. We love to style Lumiere with modern wedding gowns, sheath dresses, traditional gowns made from silk or lace. 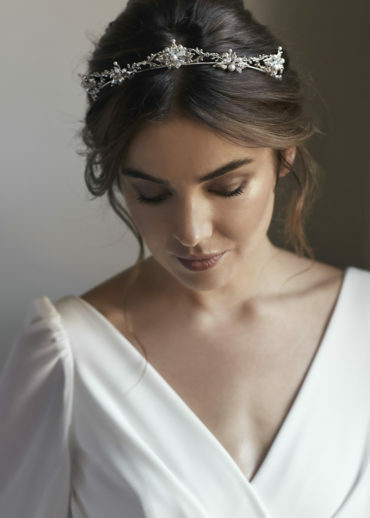 It will elevate your bridal look in an instant and we love how its pearl details feel airy and sophisticated without complicating a bridal look. The Lumiere veil pairs beautifully with modern and feminine crowns or with delicate halos. Browse our full headpiece collection or contact us and we’d be happy to offer a recommendation based on your wedding dress and hairstyle. This fingertip veil is designed to fall to 90-100cm from the comb, depending on your height. We’ll just need your height measurement, as well as where you intend to position the veil’s comb (at the crown, above a low set bun etc), as this will impact the length of the blusher and the veil. The blusher layer is designed to be pulled over your face for the ceremony or to capture beautiful photographs throughout the day. The blusher layer can be worn back, if you wish, and creates a beautiful cascade detail at the side. The Lumiere veil is handcrafted from a lightweight bridal illusion tulle. It’s available in bridal white or soft ivory tones. We like to aim for a colour match or a shade lighter than your wedding dress.